"What if First Contact doesn't go according to plan?" That was the initial question which I pitched myself somewhere around 2005, at the beginning of the planning process for the project which eventually became The Probe Has Succeeded. The story then got forgotten for a year or two, and then picked up a developed a bit more circa 2007, before starting production on the bench in the loft in January 2008. In some ways, I made things easier for myself by sticking to known quantities, particularly continuing to use the same camera which had served on my previous handful of stopmotion shorts, rather than going to the trouble of figuring out how to shoot stopmotion on my Mum&apos;s newly-acquired Nikon D80 DSLR. I had some crazy ideas about being able to finish the film by the end of the year. How wrong you can be. 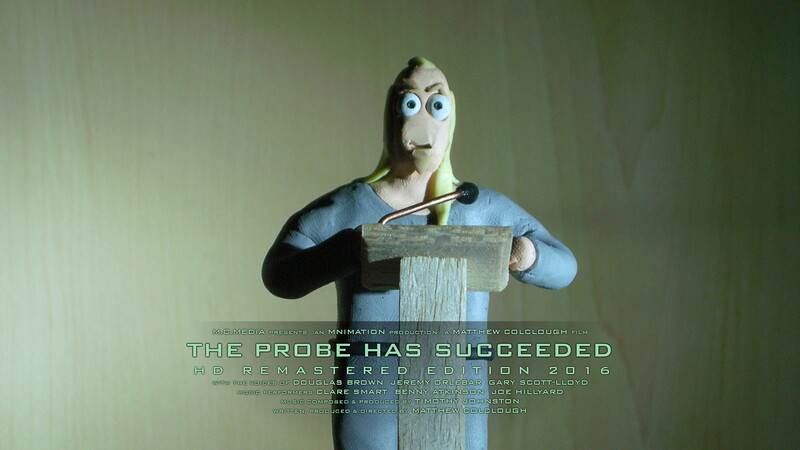 Far more ambitious than any of my previous stopmotion work, The Probe Has Succeeded required fifty-seven shots to be filmed across seven different sets, with a cast of about 15 characters (admittedly only four major ones, but still...), and by the end of 2008 I was still nowhere near finished. It ended up taking nearly two years to finish the film, pausing along the way to design such outlandish things as a future space-missions headquarters, an interstellar contact probe, a huge temple for a UFOlogist group, and of course two different species of alien - then roping in three of my college lecturers to voice various characters, and eventually wrapping up and releasing in December 2009. For a few years, that was that. In 2013, however, I set out on a project to remaster a few of my older animated films. 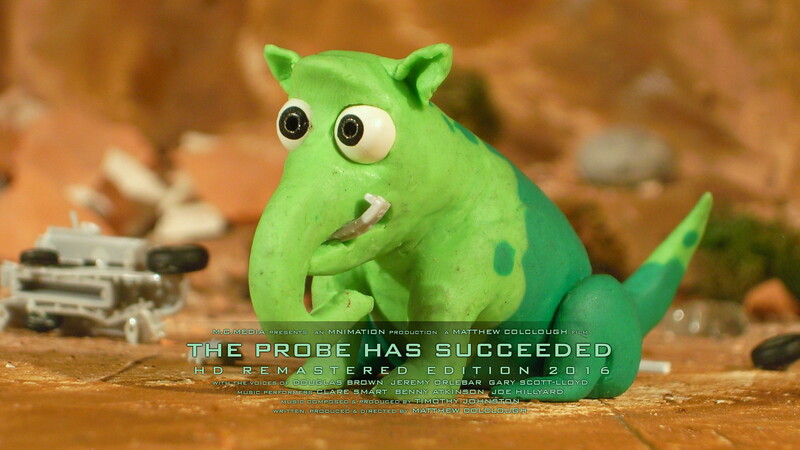 The Probe Has Succeeded was my last project shot in standard definition or mastered in Ulead MediaStudio; from late December 2009 I started editing my new films in 720p HD using Sony Vegas, and shortly after that I got to grips with animating on the D80. 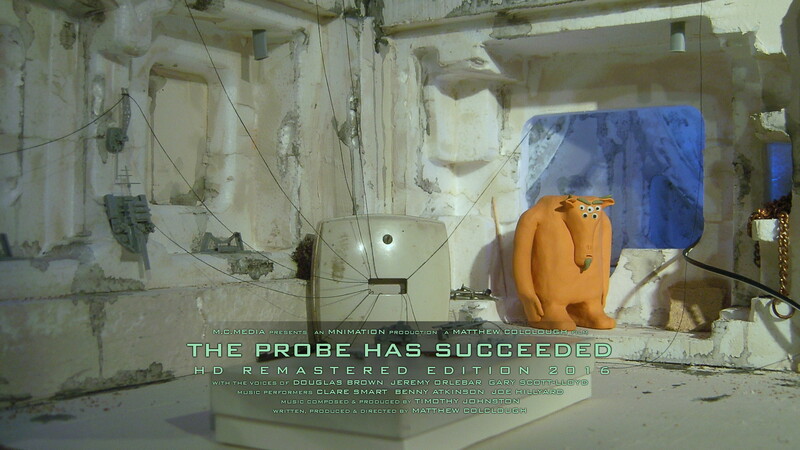 A few years into the brave new HD era, I reassessed a group of shorts running from Spontaneous Generation (2005) to The Probe Has Succeeded, and realised that although the source footage wouldn&apos;t stand up to a 1080p Full HD transfer, it could still benefit from being remastered in the medium-resolution 720p format. I started working through the films in their original chronological order, leaving The Probe Has Succeeded as the last item on the list. Although I finished remastering everything else on my list by the end of 2013, for some reason (perhaps partly due to the huge distractions provided by The Murkum Show and the Unbelievers pilot) it took until 2016 to get round to finishing the last instalment. However, the delay had one major advantage: as part of the overhaul, I had asked my long-suffering musical friend Tim to write a whole new musical score for the HD Edition, replacing the original track which wasn&apos;t written for the film with something which would follow particular characters&apos; story arcs more closely. Not to say that Tim couldn&apos;t have written a decent score in 2013, but both his composition and his production toolkit had progressed in leaps and bounds between 2013 and 2016, which meant that by the time the new score was finally produced it was a far better piece of work than would have been possible when I first set out on the remastering project. By 2016, I had also met a lot of excellent actors as part of my work on Unbelievers, one of whom lives just up the road from me and was game to try his hand at voice work for animation, which provided the opportunity to expand on the originally-tiny role of the Space Missions Control announcer, recasting the part (as I had long since lost contact with the original) and recording additional dialogue. These guys provide a relatively sensible perspective on the unfolding events - you know, what with being scientists and all that. This team have devoted themselves to the goal of alient contact, and although their role seems passive for the bulk of film, they are the ones whose efforts in designing and launching the probe led to the film&apos;s events happening in the first place. In stark contrast to the scientist types, UFOlogist nutcase Harrison and his audience at the Genetic Temple spend the film getting all emotional and overexcited about the events on the probe&apos;s video feed. While they share the same underlying fascination with aliens that drove the scientists, they express it in a very different and arguably less logical manner. Odom doesn&apos;t even live on Harcom-1. He just wants to get his ship fixed and get back home, and he doesn&apos;t have time to deal with his dog bringing him some crummy piece of foreign technology.